Do more than just watching TV and movies and enhance your entertainment environment by transforming it into an automated home theater with the Byte3 Mini PC. Learn how to set up your Byte and connect to your smart home just in time for the holidays. Setting up your Byte to create a home theater is very simple. First, you’ll need to connect your Byte to your television. Once plugged in you’ll have to select your device settings and create a login. 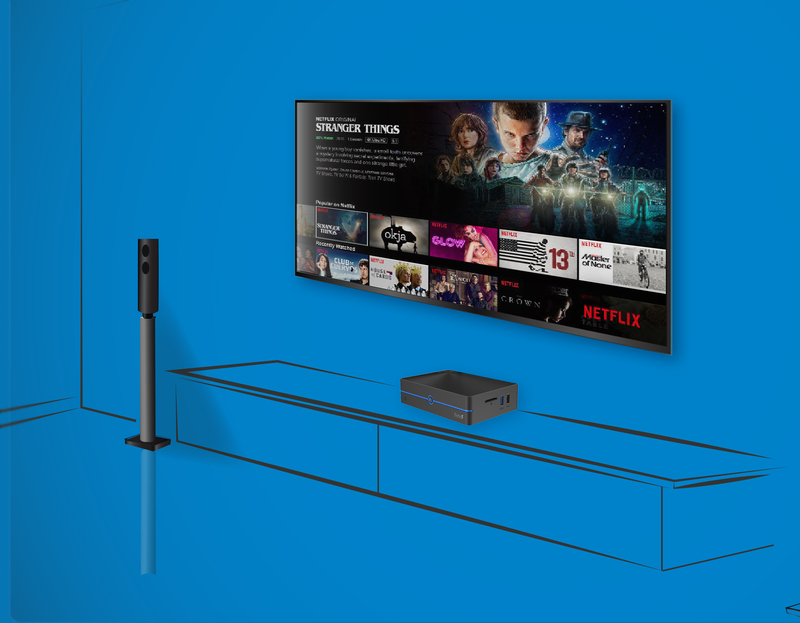 Since your Byte comes with a preinstalled system, once you have finished your basic setups, it’ll be instantly be ready for use and customizing, such as connecting your accessories to build out your home theater. If you want more information on to connect your Byte3 and set it up for your Home Theater, then read our blog How to Setup Your Byte3 for Entertainment. Your Byte device comes as a clean slate, ready to be customized for your entertainment. Once turned on and ready for use, visit the Microsoft app store found in the home menu to download your favorite streaming applications. For movie and show watching, we recommend downloading apps such as: Hulu, Netflix and Amazon Prime. These apps let you stream your favorite shows and movies, so you can have those ultimate binge-watching nights. You can also stream music by searching and downloading apps like Youtube, Spotify, iHeartRadio or Amazon Music. Streaming games and audio/visuals books is also possible by searching your favorite desktop games and titles in the app store, or looking through the recommended lists to discover new apps. We also recommend using Microsoft Edge or other downloadable browsers to surf the web, so you can enjoy sites that may not have apps or are not found in the Microsoft store. Once you are finished downloading all your necessary apps – use your Lynk remote to navigate through them. If you want a recommendation on must-have apps to use with your Lynk, here are our best 5. Using Cortana can elevate your home theater experience. Cortana is Microsoft’s virtual assistant that has the ability to control your home theater environment, as well as help quick launch your apps, answer your questions, set reminders, and more all via type-search or voice command. Once you’ve done that, you’ll be able to ask Cortana to control your compatible smart device based on your customizations. You can say things like “Hey Cortana, turn off the lights” if your smart bulbs are paired or “Hey Cortana, raise the volume to 24″ if your smart speakers are synced. Note: When purchasing smart home accessories to synchronize with your Byte Cortana, make sure they’re Windows and Cortana compatible.